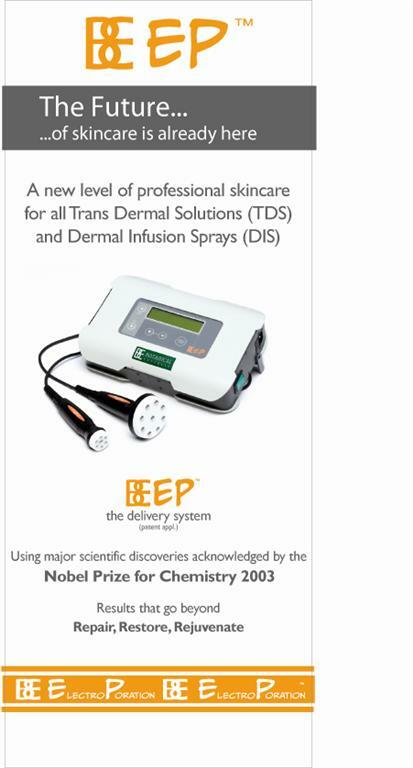 In 2009, Botanical Extracts (BE) lodged patents for the most advanced use of ElectroPoration technology, as a topical delivery system of atomically stable actives, using a process of fractionating surface tension through a calibrated Microspray. This patented delivery system relies upon the BE Dermal Infusion Sprays to be effective. The science of ElectroPoration was born out of the IVF program’s need to allow greater permeability of cells and cell clusters for the introduction of substances with a larger molecular size, without ongoing changes to the microbiology. It was then further seen as a means to facilitate the penetration of non charged active products into the skin through the application of its radio frequency and electromagnetic wave. In this, it facilitated the formation of aquaporins and the subsequent awarding for that science of the Nobel Prize for Chemistry in 2003. The BE development brings with it the promise of the greatest absorption of high tech plant derived actives, for previously unobtainable skincare results. ElectroPoration is a phenomenon that occurs within the cellular membranes while applying pulsed, modulated, non thermal and non-ionized electromagnetic waves (EMW) of hectometric frequency, produced by a low amplitude, intensely alternating current within the application wand. These EMWs produce an alteration of the cellular membrane potential. This alteration provokes a biological “moment” with an electro rotation of lipids in the phospholipids’ bilayer of the cell membrane, causing pore formation and the momentary opening of its protein channels, which will enable substances to enter the cells. This kind of phenomenon known as ElectroPoration is reversible and temporary because the applied current is pulsed and not constant, so the cell returns to its normal state once the impulse discharge is stopped. It is an ON-OFF mechanism. With ElectroPoration we can temporarily alter the plasmatic membrane’s permeability, causing the opening of intracellular channels and enabling the introduction of active ingredients through the BE Dermal Infusion Sprays.